I do really like Prabhas. He always seems to be a little surprised to be the hero of any film and with his height and general gangliness he has a ‘St Bernard puppy’ type of cuteness that is very endearing. Even though his films seem to follow a similar pattern, he brings enough personality to each character that I’m usually happy to watch no matter how many plot holes or illogical scenes there seem to be and this film does have a few of those. Varsham is a typical Prabhas action/romance movie. The story involves two guys fighting over the heroine like dogs over a bone, with each one growling ‘she’s mine’ at appropriate intervals. But when one of those two is Prabhas and the other is Gopichand it’s suddenly a lot more fun. Add in Prakash Raj as ‘Prakash Bad Dad’ and it’s much more entertaining than it first sounds. Trisha plays Sailaja, the girl who both Venkat (Prabhas) and Bhadranna (Gopichand) lay claim to. Sailaja is a fun-loving girl who adores the rain, and I fully understand and endorse her compulsion to dance in it at every possible opportunity. Venkat and Bhadranna first both see her at a train station where their train has been delayed. Once the rain starts Sailaja leaps out onto the platform to dance with total child-like abandon. She follows the ‘dance as if no-one is watching’ creed, despite the fact that everyone is actually watching her and this is a very fun song with plenty of dorky moves by Trisha. There’s a great pigeon move in here too and I’m very impressed by Trisha’s grasp of the bird-impression genre of dance step. Venkat and Sailaja are separated as the train moves off, but find each other the next time precipitation hits their local market in Warangal. Since the rain seems to bring them together they make a pact to meet again when it next pours. However, just as the rain clouds form again there is the small problem of Bhadranna who has come to Sailja’s house to arrange marriage with her. Sailaja’s father Ranga Rao (Prakash Raj) is a drunken gambler who wants to make the best use possible of his daughter to fund his chosen life style. But while Bhadranna has schemed to put Rango Rao in his debt, trying to use his weakness for gambling to force Sailaja into marriage, Rango Rao is one step ahead. Luckily, a film producer has seen Sailaja and is desperate for her to act as his latest heroine. This will naturally pay extremely well, plus hopefully be a source of revenue for years to come, so Ranga Rao is in no hurry to marry his daughter off. And despite appearances, Ranga Rao is wilier than Bhadranna gives him credit for. He plays Venkat and Bhandranna off against each other, reasoning that he can use Venkat to get rid of Bhandranna and therefore his debt, and then separate Sailaja and Venkat. This is exactly the path he follows and even when his daughter is later kidnapped by Bhadranna he’s still tries to make the situation turn out to his advantage. Luckily for Sailaja she has the support of her feisty and opinionated grandmother who has a very low opinion of her son-in-law. It’s also a pretty accurate one. Sailaja’s mother is a bit of a wet blanket and unable to take a stand against her scheming husband, whereas her grandmother actively supports her relationship with Venkat and obstructs Bhandranna as much as she can. 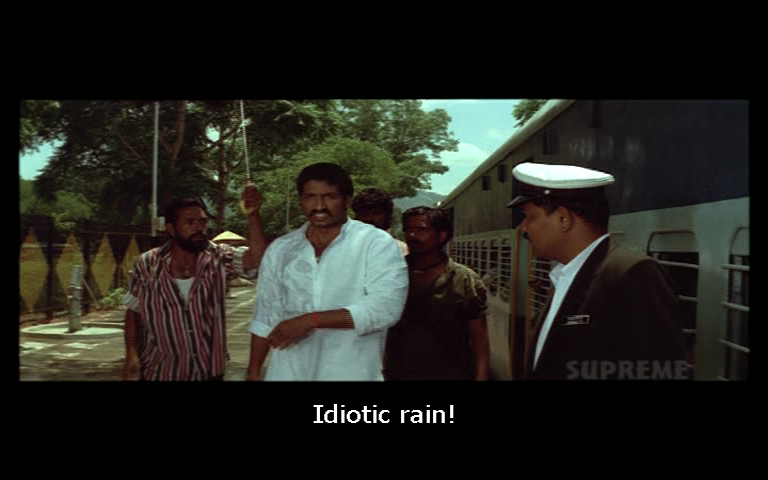 Bhandranna doesn’t stand a chance though – he has entirely the wrong opinion about the rain. Unlike Venkat who has a much better appreciation of the things that matter to Sailaja. Although the story itself is nothing new, the appeal here lies in the performances of Prabhas and Trisha who really do bring their romance to life. They have great chemistry, especially in the songs and the love story comes across as natural and unforced. After all as Sailaja puts it, Venkat is tall and handsome – what more does a girl need? Their first meetings in the rain are beautifully captured and make good use of the hazy lighting. In the later scenes Prabhas is all action, which he does so well, especially with the great fight scenes choreographed by Peter Hein. But Sailaja fights back too and isn’t at all a typical sobbing heroine. I really like her characters attitude even if she is a little too gullible when it came to her father and too ready to believe the worst of Venkat. I also appreciate the references to the Ramayana throughout the story. The kidnap theme is a straight take from the Aranya Kanda, but there are plenty of other references. These range from Bhandranna trying to change the outcome of the story in a re-enactment at his mansion, to the final showdown involving a large Ravana cutout, which all add yet more layers to the story. I love the songs by Devi Sri Prasad and they are generally well placed in the movie. The best are those with Venkat and Sailaja in the rain, although I do like the multi coloured chicks in this song, and both Prabhas and Trisha look to be having fun. 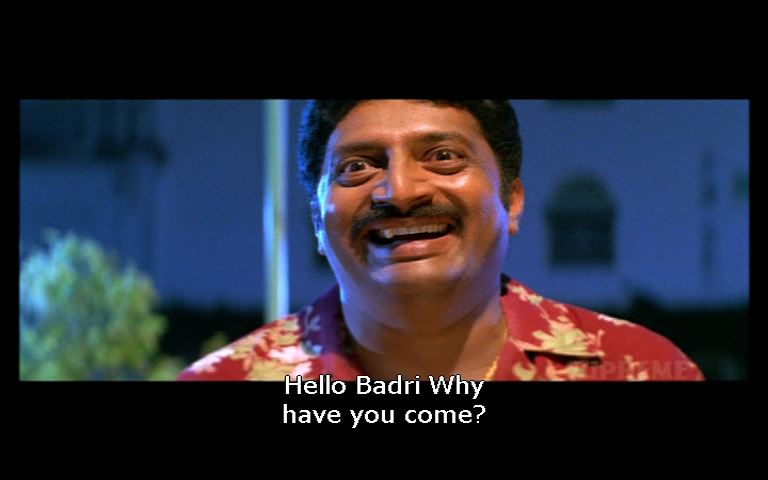 But despite my love of Prabhas, Prakash Raj is the scene stealer as the selfish and greedy father. He has a habit of running his tongue over his crooked canine tooth while he is scheming and it becomes quite mesmerising after a while, acting as a gauge of just how manipulative he is planning to be . Ranga Rao also has a collection of very loud shirts and the combination is enough to put him into the ‘bad dad’ faction even before he starts his fake suicide attempts and general bribery of his daughter. Jayaprakash Reddy as the producer aids and abets Ranga Rao’s plans in order to get his film made and the two have some of the funniest scenes in the film. There is a small separate comedy track involving Sunil as Venkat’s friend Jagan and his quest for romance. Since Sunil is another favourite and the comedy is inoffensive and not too intrusive it doesn’t detract from the rest of the film for me. Ajay also turns up as one of Prabhas friends which is another point in this films favour although his character is of the blink and you’ll miss him variety. 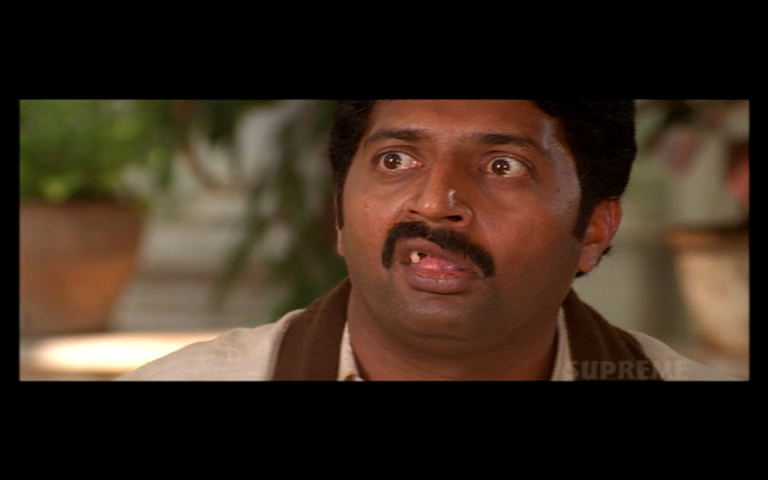 Varsham is the first time I’ve seen Gopichand act, and I think he’s excellent as the villainous Bhadranna. He’s not overtly evil, but you just know he’s the sort of person who pulled wings off flies as a child. OK, killing his father was the first clue, but most of the time he’s rational and normal until you look at his eyes, or he suddenly snaps and casually kills someone. Bhadranna is the centre of his world and the sooner everyone around him realises that and falls into line, the easier it will be for them. Shafi has a small but important role here as Bhandranna’s step-brother Kasi, and he’s sleazy and fanatical enough to make his initially pitiful character quite obnoxious by the end. It seems to be his special talent. Great songs, crazy fight scenes (Venkat has amazing bullets that manage to flip jeeps), Prakash-Raj-bad-dad and a very sweet romance make this one of my favourite Prabhas movies. It’s worth watching for the beautiful rain shots alone but Trisha and Prabhas are excellent together in this film. 4 stars. The structure of the simple story was quite good, and I like the overt Ramayana references. Bhadranna demanding that the local actors change the script to allow Ravana to tie the nuptial thread around Sita’s neck was just one of many signals that he was the real deal when it came to insane villainy. But the heroic Prabhas was just as demanding. Venkat was the type of hero who expects to be worshipped and he had no tolerance for people questioning him. In many respects there isn’t that much difference between hero and villain as they are both self centred and moody. Prabhas has a very likeable presence when he isn’t sulking or killing people, while Gopichand has a harder edged energy. It was the actors who made that dynamic work as apart from flagging Venkat as ‘poor but honest’ and Bhadri as ‘eeeeevil but artistic’, there was little else in the script to develop the characters. The small scale of the drama and the characters’ dreams made the film a little more engaging and plausible. The character actors were pretty good and helped paper over some of the plot holes just by being believable in their supporting roles. Prakash Raj was good but not great. I found his characterisation fluctuated between extremes of buffoonery and cunning and it didn’t feel cohesive. If he had dialled it down a little in some scenes, the sly con artist and schemer aspects of Ranga Rao would have been more convincing. My first thoughts on seeing Trisha cavorting around in the rain went along the lines of ‘Hello..an escaped mental patient.’ Why do Indian film directors seem to associate carefree innocence with behaviour that is borderline crazy? And that is pretty much the last thought I gave to Trisha. She was adequate but I think almost any actress could have delivered that performance. There is rather a lot of kissing (seen and implied) although there is minimal chemistry between the stars, even with Trisha licking melon pulp off Prabhas’ face. The songs are colourful, and Prabhas and Trisha incurred the wrath of the wardrobe team in some of the picturisations which made them extra entertaining. Prabhas’ signature dance steps seem to be stomping or undulating and he often got to do both. Sometimes while wringing wet. There are some nice little details in the design, and I liked seeing Bhadranna still using a gramophone – so stylish and retro. The action scenes were good, and I appreciated Venkat’s dedication to leaving no car unturned in one encounter. Prabhas is very comfortable as an action man, and tackles the fight scenes with gusto. This is a pretty run of the mill romantic drama and while it was a perfectly acceptable timepass, there is little to set Varsham apart. 3 stars. This entry was posted in Tollywood and tagged Devi Sri Prasad, Gopichand, Jayaprakash Reddy, Prabhas, Prakash Raj, Raghu Babu, Shafi, Sobhan, Trisha, Varsham. Bookmark the permalink. I like that directors are adding the guys in to the traditional wet sari song though – that makes it much more watchable for me!! The LSD in the water might explain some of the costume choices as well 🙂 Oh, and I think you could add Kanthaswamy to that list of Tamil films too! I didn’t mind Trisha dancing in this – she was very spazzy, but I’m quite sure that’s what I look like too, so I’m not going to judge her too harshly! But I have to admit that I’m one of those people who likes to dash outside and dance in the rain – I always thought it was a result of my upbringing in Ireland where there is never any other choice though 😉 And I prefer to do my rain dancing in wellies and a raincoat! That seems like a very sensible idea! Not quite so much of a problem in Ireland where the issue is more the wind chill factor! Isn’t the other rain song just beautiful? The one in the temple! So romantic and wonderful chemistry there! And incidentally, Varsham was the movie that got me interested in Devi Sri Prasad’s music. LOL @ “escaped mental patient”. Every time I watch that song I have the same reaction, although I have nothing against dancing in the rain.